Kettlebells are one of the big buzzwords in the fitness industry right now. If you aren't already a kettlebell devotee, you might be wondering what they are and if they are just another passing fitness fad. We'd love to take a few minutes to introduce you to this small-but-mighty piece of equipment, and answer all of your burning questions about it. First of all, we have good news. While the kettlebell may be relatively new to the American fitness scene, it's one of the world's oldest workouts. Believe it or not, kettlebells--or things that look mighty like them--have been found in excavations of ancient Greece! The kettlebell, which is best described as a cannon ball with a handle, has a long history in Europe and Russia, beginning in the 1700's. Originally used as a counter weight for measuring grain in Russia, it became a popular part of "strong-man" routines in the Victorian era. Since their introduction to the western hemisphere, kettlebells have become a mainstream training tool. What makes a kettlebell workout different than using dumbbells or free weights? The short answer to that is the shape of the kettlebell. Instead of placing the center of gravity in your hands, the kettlebell puts the center of gravity outside of your hand, which means it can change depending on how you're holding and moving it. Revisit your high school physics class for a second to consider that this allows kettlebell movements to have some momentum behind them. Momentum creates centrifugal force, which focuses more attention on muscles that we use for deceleration and stabilization. Those would be your "core" muscles. Kettlebell training involves the entire body, which is the goal of functional fitness. This type of multi-directional movement mimics real life movements--such as swinging a suitcase to put it in an overhead bin, or bending to lift a basket of laundry. Science is backing up the benefits of kettlebell training. In a recent study by the American Council on Exercise, researcers found that after 8 weeks of kettlebell exercises, participants had significant improvement in endurance, balance, and core strength. In fact, core strength increased by an impressive 70 percent! Anxious to get started with your own kettlebell workout? A note of precaution: the way to get an effective workout and avoid injury while working out with a kettlebell is to make sure you are using proper form. A Cal Fit personal trainer can help you with this, or you can use this helpfully illustrated article to learn about good form. 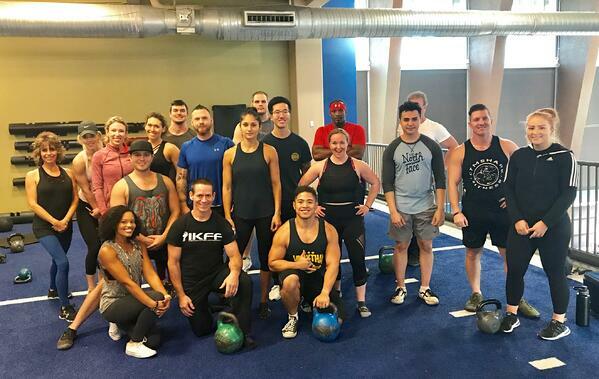 Recently, Cal Fit hosted internationally renowned kettlebell expert Steve Cotter, who provided special training to many of our Cal Fit trainers. Steve works tirelessly to share the power of kettlebell far and wide, and his efforts to teach his art form has globally impacted the growth and popularity of kettlebell training. Steve literally wrote the book on Kettlebell Training, and loves to teach and share his unique experience to promote health, happiness, and longevity through fitness. These trainers are currently progressing towards becoming certified kettlebell instructors, but in the meantime they are happy to help you implement kettlebells into your workouts. We encourage you to make an appointment with a trainer at your Cal Fit location today!